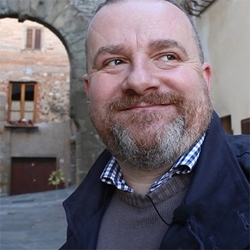 Luca Marchiori takes us on a tour of the provinces of the Veneto, highlighting each area's local dishes, famous ingredients and culinary traditions. Like Julius Caesar’s Gaul, the territory of the old Venetian Republic is today divided into three parts: the regions of Trentino Alto-Adige, Friuli-Venezia Giulia, and the Veneto. Appropriately, in Caesar’s time these regions were part of Cisalpine Gaul, and the name Veneto derives from the name of the Celtic tribe who lived in the area. Although Cisalpine Gaul became part of Roman Italy in 49 BC, it retained an otherness which, due to the Italian peninsula’s long history of division and unification only arriving in 1861, persists to this day. Veneto is a region of dramatic differences. It starts high up in the mountains on the Austrian border then rolls down towards the Adriatic Sea, where it finishes with a final flourish in the city of Venice, the bell tower of San Marco becoming the exclamation mark on the word ‘wow’! 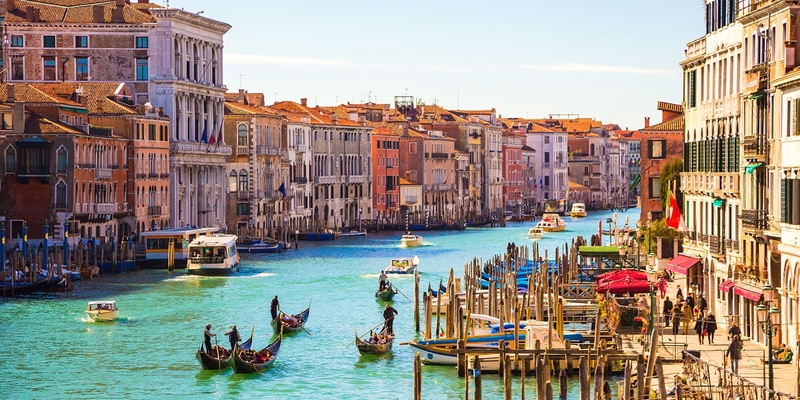 Venetian dialect and its sub-dialects are as widely spoken as they were during the thousand years of the powerful Venetian Republic, known as La Serenissima (‘the most serene’), the memory of which is still very strong. The flag of the republic, a red banner bearing a golden lion, is still the official symbol of the region. Modern Veneto is divided into seven provinces, each named after the provincial capital. These are Belluno, Padua (Padova in Italian), Rovigo, Treviso, Vicenza, Verona and Venice (Venezia). Each province has a distinctive character and, as we shall see, unique cuisines rich in dishes and local produce. The cuisine of the Veneto is characterised partly by the carbohydrates eaten all over the region. Unlike many parts of Italy, pasta is not the staple – that role is played by the double act of polenta and rice. Polenta is an ancient dish dating back to Roman times made by boiling up various ground meals to form a kind or porridge, or when cooled, bread. Since the introduction of American products to Europe, it has been made predominantly with cornmeal. Most modern polenta is yellow, but there is also a white version made from biancoperla maize. In the Veneto, you will see polenta served as a side dish for meat and game in its liquid form, or in its hard form, sliced and toasted. Risotto is a very common primo in the Veneto with much of the rice being imported from nearby Lombardy and Piedmont. However, there is also a substantial rice growing area in the province of Verona where paddy fields are irrigated by the river Tartaro. The rice here is IGP-protected and known as Vialone Nano Veronese. The Venetian pasta is bigoli, and is like thick spaghetti made with buckwheat or whole wheat and usually eggs (although as with many things in Italy, there are lots of variations). The large Venetian lagoon and Adriatic coastline to the east of the Veneto provides many fish for the dishes of the region (not forgetting that the western edge of the Veneto is dominated by Lake Garda). Mussels, clams, crabs, anchovies and sprats are in abundance and often on the menu. Bream and sea bass are found in the area and are often served as secondi (main courses). The black goby, a resident of the lagoon, often swims its way into risotto di gò. The Veneto is a wine producing area with several famous Italian varieties – both red and white – coming from the region. A lot of grape production focuses on local varieties, but more international varieties such as Cabernet Sauvignon and Chardonnay are also grown. Let’s now take a tour of the region, starting in the Dolomites and finishing in the city of Venice, and look at some of the most famous provincial products and dishes. High up in the Alps on the Austrian border, even the lowest parts of the province of Belluno are a good 700 metres above sea level. The highest point is the Marmolada mountain in the Dolomites, which reaches 3,343 metres. As you would expect, the cuisine in this area has an alpine quality, with capriolo (roe venison) often on the menu, as well as plenty of cheese. One of the most famous cheeses of the province is Schiz. Originally made from the cheese that squirts (schizza) out of the moulds during the production of certain other cheeses, it’s now considered a delicacy in its own right. It’s a semi-hard cheese which is always eaten pan-fried with polenta or fresh mushrooms. Another speciality from Belluno is pastin, a thick sausage made from a mixture of pork and beef flavoured with white wine and spices. Most often it’s sliced then grilled and served with polenta, although for festivals it’s sometimes cooked in a kind of baguette and eaten like a sandwich. Casunziei are a kind of half-moon shaped pasta often filled with beetroot. You can find these served in the restaurants near the the town of Cortina d’Ampezzo where they make a restorative après ski dish. 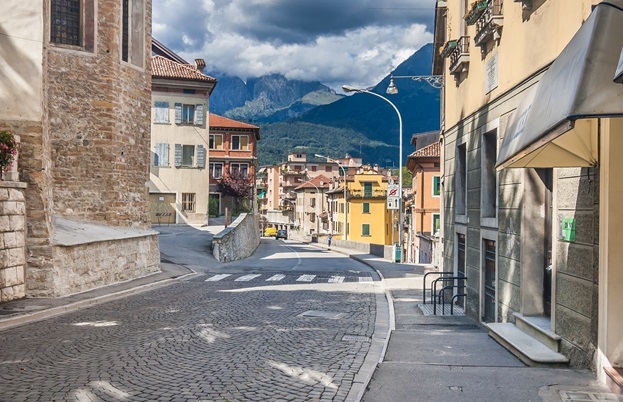 To the south of Belluno is the province of Treviso. 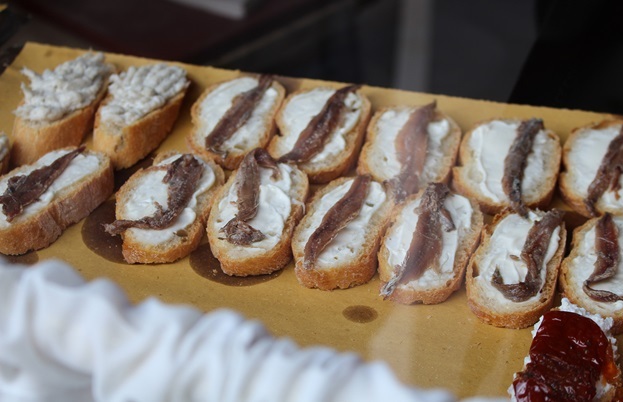 One of the most fertile areas of the Veneto, it is home to several products famous all over Italy, as well as one of the most famous Italian desserts. 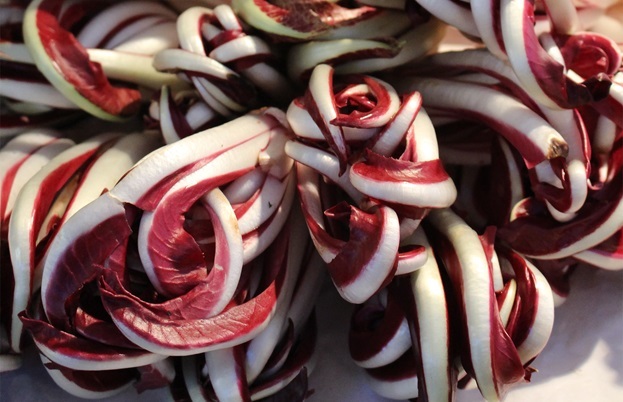 Radicchio Rosso di Treviso Tardivo IGP is a kind of chicory noted for its mild flavour which makes it perfect in salads. It also looks beautiful since the leaves look like the legs of an octopus. This is caused by a complex process of cultivation, some of which is done in the dark. It’s often served as the main ingredient of a stunning risotto. Part of the plain of the river Po where Grana Padano cheese is made falls into the province of Treviso. This is a type of hard cheese very similar to Parmesan that’s used in the same way. Many different wines are produced in the province of Treviso but the most famous of them by far is Prosecco. 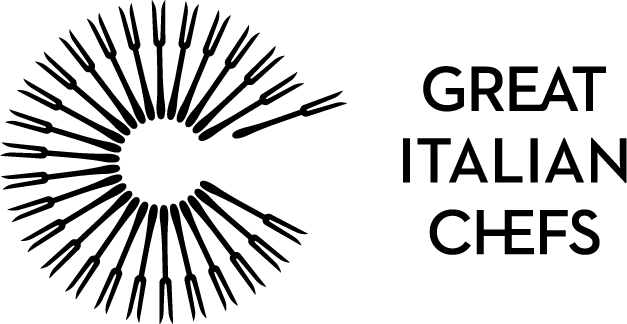 The Valdobbiadene area is widely considered to be the home of the finest quality Prosecco, most of which is made from the local Glera grape, although small quantities of other grapes such as Chardonnay are allowed. 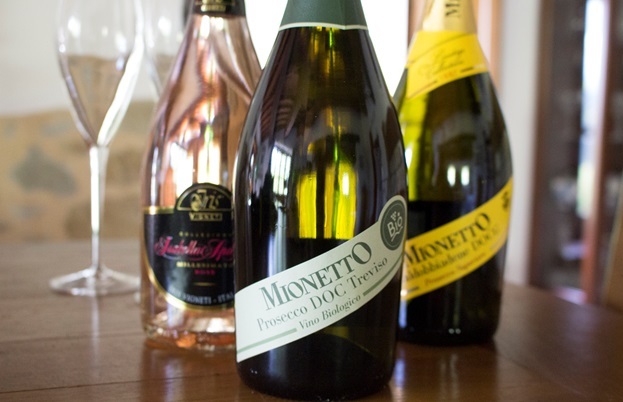 Prosecco is usually a sparkling wine with a character like Champagne, but there is a less fizzy version known as tranquillo which is equally delicious. According to legend, in the 1960s a chef called Roberto Linguanotto created a dessert at the Alle Beccherie restaurant in Treviso. Made with strong coffee, mascarpone cream and sponge, he called it ‘pick me up’, which in Italian translates to tiramisu. Although other restaurants (all in the province of Treviso) have been credited with its creation, the dish was certainly unknown before this period and in fact the name has only been widely used in print since the 1980s. The western border of Treviso touches Vicenza. 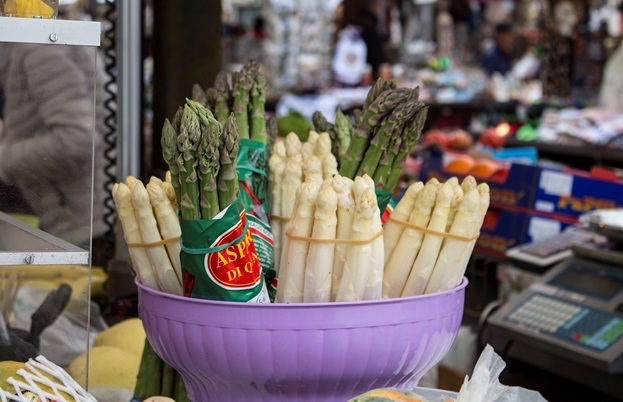 The most famous products from the province include Asiago cheese and the white asparagus from Bassano. Asiago, which takes its name from the town of the same name, is a salty white cheese made from cow’s milk. It is eaten fresh or aged for up to two (or more) years. Although it is found all over the Veneto, white asparagus from Bassano is amongst the most prestigious. The colour is achieved by picking the spears before the shoots appear above ground and have the chance to turn green. In the Veneto, white asparagus is eaten with boiled eggs in various forms. The full name of Bassano, Bassano del Grappa, gives its name to another local product, a spirit made from distilling the parts of the grape left over from the winemaking process. Different flavours and styles of grappa are made by using various grape varieties, and some are aged in oak casks. Aged grappa, known as barricata, has a yellow colour and a much more complex flavour. Cren is a kind of hot horseradish sauce typical to the province of Vicenza. It is eaten as an accompaniment to meat and sometimes stews. It’s prepared by mixing fresh horseradish with dried bread, vinegar and olive oil. 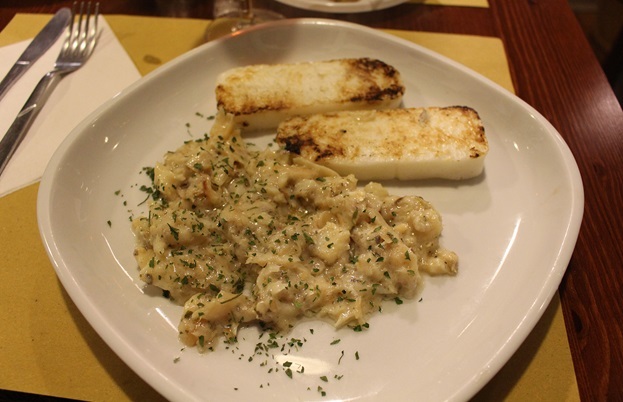 Perhaps the most famous dish to carry the name of Vicenza is baccalà alla vicentina. This consists of stoccafisso (or stockfish, an air-dried variety of fish), cooked with onions, olive oil, sardines, milk, cheese and parsley and is served with polenta. Moving west from Vicenza we reach Verona. 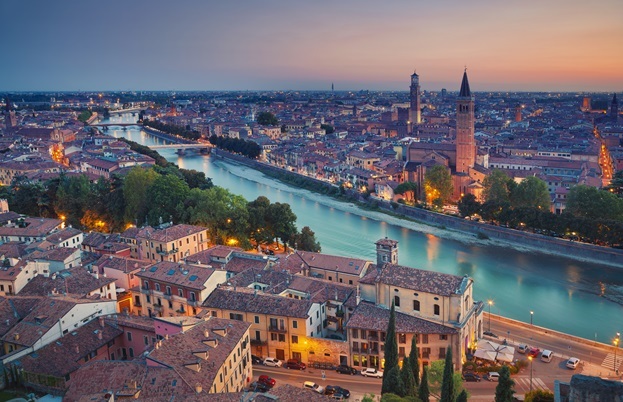 Set on the eastern edge of the Veneto, Verona is separated from the region of Lombardy in the east by Lake Garda. On the eastern side of lake is the Bardolino winemaking area, famous for its red wines made mostly from the local Corvina grape. Another local wine, Amarone, is often paired with Vialone Nano Veronese IGP rice to make a wonderful risotto all’amarone, deep red in colour and with a rich hearty flavour. Rich stews served with polenta are also a feature of Veronese cooking, such as brasato all’amarone (beef braised in red wine) and pastissada de caval, a horsemeat stew that’s made rich with medieval spices. The dry white wine Soave is also made in the province of Verona, from Garganega and Trebbiano grapes. As far as desserts are concerned, the most popular Veronese dish is Pandoro. Literally meaning ‘golden bread’, it’s a sweet brioche-style cake dusted with icing sugar. Like the Milanese panettone, but much older, it has now become an Italian staple for Christmas and the New Year. Running along the border of the Veneto and Emilia-Romagna, the cuisine of Rovigo is influenced by both regions. Along with Venice, it’s one of the two provinces of the Veneto to have a coast on the Adriatic and this is reflected in an increased amount of fish eaten in this area. A common dish is fritture di pesce – mixed pieces of fish, freshly fried in batter. To the north of Rovigo is the province of Padua. Vast quantities of the biancoperla corn are grown here, which is used to make white polenta as opposed to the more common yellow variety. Oca in onto padovana is a delicious way of preparing goose. It’s salted and then left for a few days to marinate in the fat which the salt draws out, before being aged for a couple of months before eating. The gallina padovana, or Paduan hen, is one of the oldest breeds of chicken known in Europe. Horsemeat is also widely eaten in the province and sfilacci di cavallo, very thin strips of dried horse meat that look almost like pieces of saffron, are a local delicacy. They are eaten alone or with pasta or risotto, and have recently become a popular pizza topping. The Euganean Hills (Colli Euganei) are situated in the province of Padua and are famous for a beautiful dessert wine called Colli Euganei Fior d’Arancio, made from yellow Muscat grapes. It was in the city of Padua that Aperol, a bright orange liqueur, made its first appearance in 1919. It’s now seen everywhere as part of the cocktail called Aperol Spritz – one part soda water, two parts Aperol and three parts Prosecco. The final province of the Veneto is Venice, dominated by the large lagoon and the city of Venice itself. As you would expect, it has perhaps the richest tradition when it comes to food since the city of Venice was once the capital of a large trading empire and one of the most prestigious cities in the whole of Europe. Many of Venice’s traditional dishes are fish-based. Bigoli in salsa (pasta in an anchovy sauce), risotto al nero di seppia (risotto cooked with cuttlefish ink) and sarde in saor (sardines preserved in a sweet and sour marinade) are amongst the most famous dishes from the province. Also very popular are moeche, small green crabs fished out of the lagoon in the spring which are cooked and eaten whole, shell included. Ironically, for a region with a large coast, baccalà, dried fish from the north Atlantic, is very popular. In baccalà mantecato, it’s soaked, cooked in milk and then pounded with olive oil to make a kind of pâté, eaten with disks of white or yellow polenta. Risi e bisi is a kind of risotto made from peas and pancetta. It has an almost mythical status and is said to have been served to the Doges of Venice on the feast of Saint Mark (25 April) which is the National Day of Venice. Pasta e fasioi is a winter warming dish consisting of a bean soup with small pieces of pasta in it. Among the most famous Venetian desserts are fritoe, a kind of donut made during the carnival season and pinza, a pudding made from dried bread, milk, sugar and sultanas. Baicoli are a kind of thin biscuit, often eaten dipped in coffee with zabaglione or crema al mascarpone (cream cheese mixed with sugar, eggs, and rum). They are most famously made by the firm Colussi and sold all over the province in a distinctive yellow tin. 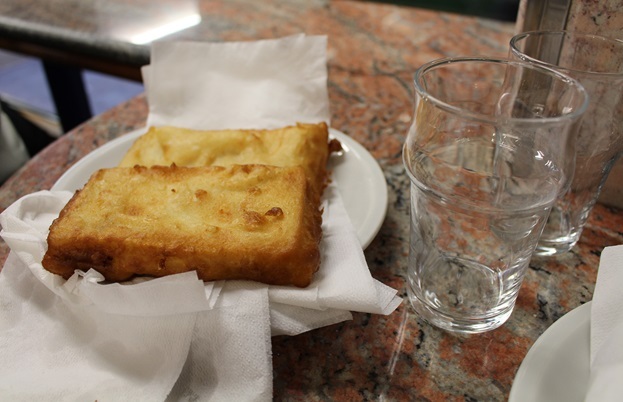 Mozzarella in carozza (deep fried mozzarella sandwiches) are a local speciality, with the best ones said to come from the Rosticceria Gislon in the centre of Venice. However, aficionados will often go to Mestre, on the mainland, to eat these. The city of Venice is also famous for cichèti, small plates served in bacari, the city’s traditional wine bars. These have always been popular but have recently become a bit of a Venetian sub-culture, enjoyed by a new generation of Venetians as well as being increasingly appreciated outside the country.